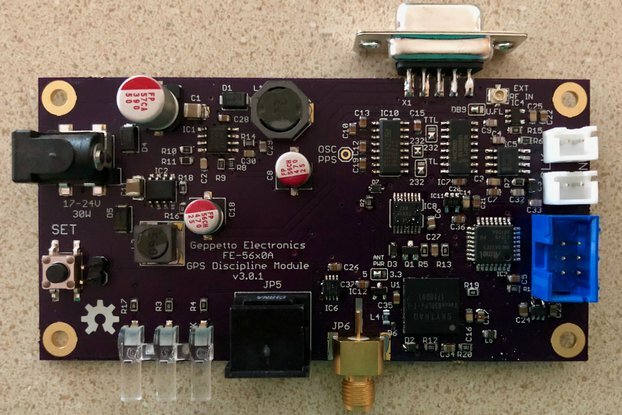 This is a GPS disciplined high precision oven controlled crystal oscillator. It has a short-term Allan deviation specification of < 1e-11 @ 𝜏 1s, which means that most of the time the frequency will be within 0.1 ppb. GPS is used to continuously discipline the frequency to maintain accuracy. The unit comes with a 5 VDC power supply (90-240 VAC 50/60 Hz with a North American plug - a passive prong adapter is all that would be required for worldwide use). If you wish to power it yourself, it requires 1A. The output frequency of 10 MHz is provided as either a 5 volt square wave or as a +13 dBm sine wave. The two independent output channels are supplied on BNC jacks. Each channel comes from a separate channel of a fanout buffer, so each should remain independent and stable. The output picture in the gallery shows the TTL waveform delivered through 50Ω coax into a 50Ω load (1.5v P-P, 5 ns rise/fall time to 90%). 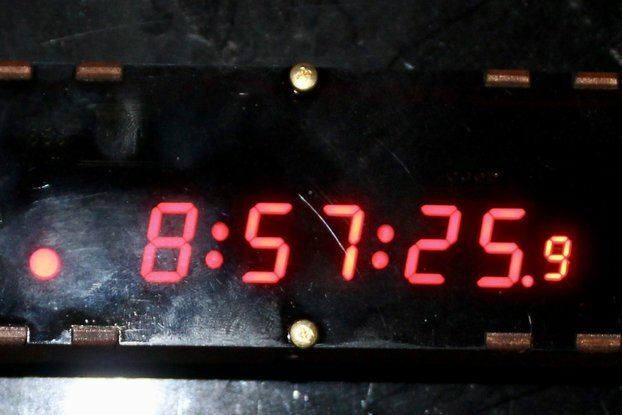 The board has three LEDs, labeled FIX, 0 and 1. 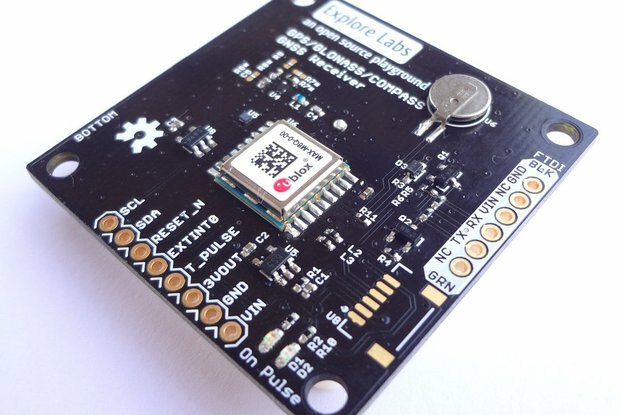 The FIX LED comes directly from the GPS module and is its indication of a GPS fix. 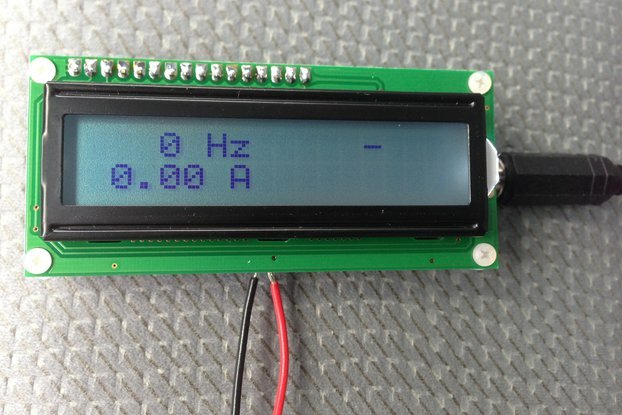 The 0 and 1 LEDs indicate the operating mode of the firmware. If they're blinking back and forth, then there is no GPS fix. If they're not, then they represent a binary value 0-3, which mean coarse (0 - both LEDs out), fine (1 - 0 on, 1 off), finer (2 - 0 off, 1 on) and finest (3 - both on) mode. The first time it is powered up, it will take several days before the unit will completely stabilize and the phase range will settle, but the frequency will be well disciplined in the meantime. Restarts after that should be able to obtain a lock faster (depending on how long it's been powered off). It is recommended that the unit be (more or less) permanently powered, as the stability of the crystal will improve with age and use. 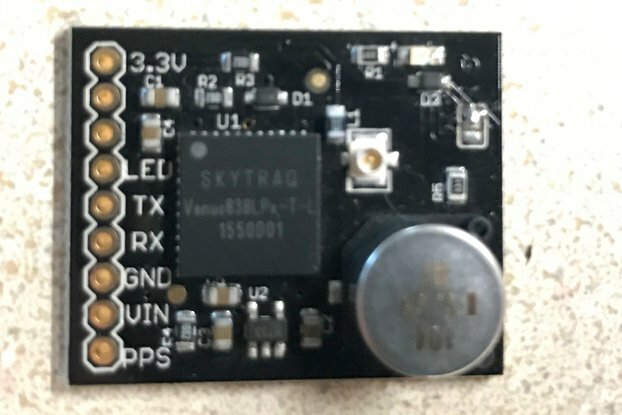 There is an SMA connector for an external GPS antenna (required and not included). The oscillator will hold-over when GPS is unavailable (however, it will not attempt to "guess" at the aging over time while holding over. Good, constant GPS reception is required for maximal accuracy). 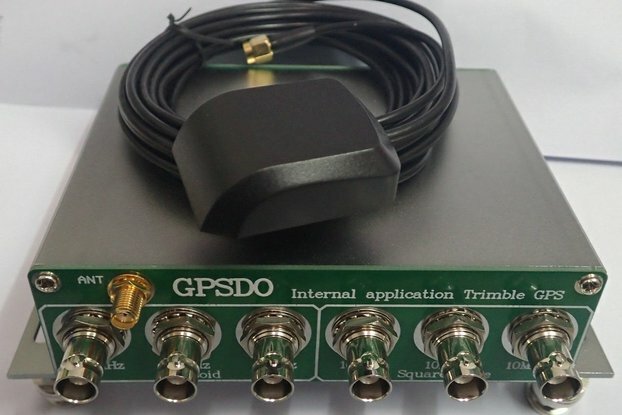 There is also a mini-DIN 6 diagnostic connector that supplies a separately buffered PPS output, diagnostic serial output from the controller and serial NMEA I/O from the GPS module. The board has a 6 pin ISP header for firmware updates. 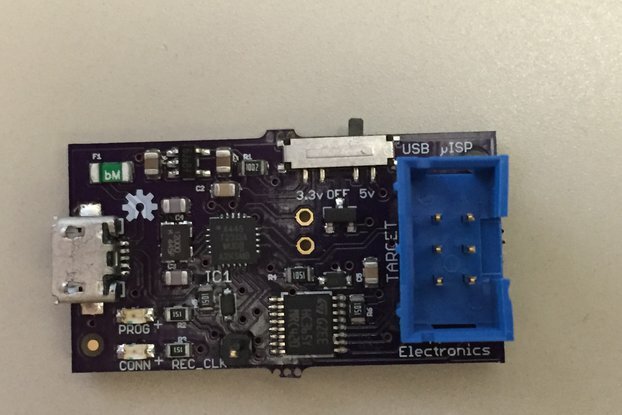 Using it requires an AVR PDI programmer with a 6 pin cable and a pogo pin programming adapter. The firmware requires only standard AVR GCC and AVR libc to build, and is open source and available on GitHub. The design is intended to produce an Allan variance of 1E-10 or less (assuming good GPS reception and good mechanical and temperature stability). The free-running OH300 oscillator has a short-term spec of no worse than 1E-11 @ 𝜏 10^0, but usually achieves around 8E-12. The pink graphs are comparisons between a unit running against a Thunderbolt after several days of warming up. They are reasonably characteristic. I had a project where I needed to perform particularly accurate frequency measurements and wanted those measurements traceable to some respected standard. This was the cheapest way I could find to do it. 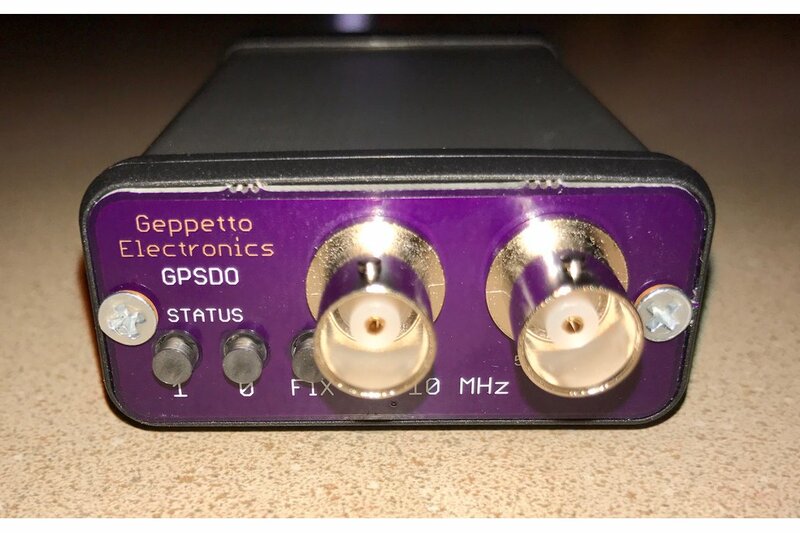 It is not intended to compete with commercial GPSDOs (which are far costlier, but you get what you pay for), but rather offer an entry level frequency standard for a reasonable price. In terms of accuracy and value, this is the best unit I know how to make. And for most hobbyist and light commercial uses, it should be more than adequate. I was looking for a GPSDO and was hesitant to buy one of those used ones on Ebay. When I ran across Nick's website felt more confidant about what I was getting because of all the posted test data. Nick was very helpful and the GPSDO arrived relatively quickly (even before the GPS antenna I had ordered on Ebay). This GPSDO is smaller then a pack of cigarettes and just works flawlessly. While Nick is very responsive to questions it would be helpful if there were a concise users manual available for it. I am using the OCXO version as an external frequency reference for my Elecraft K3S transceiver. While at present you're correct that there isn't a formal manual per se, there is extensive documentation of the design and operation over at the Hackaday project page, which is under the "Documentation" link on the store page. I ordered the OCXO variant on a Saturday and it showed up on Tuesday, I had to wait 2 more days for the antenna from Adafruit to arrive before trying it out. Even though I had seen the pictures and videos, I was surprised at how tiny it was. I plugged in the power supply and antenna and had a 3D fix pretty quickly. But I kept losing fix. I sent a message to Mr. Sayer. He replied in less than an hour with some helpful suggestions. In no time, I put the antenna outside with a clear view of over half the sky, and the issues keeping 3D fix were gone. The OCXO variant takes a few days to get complete lock. Mine took somewhere between 4 and 4.5 days. The waveforms look as expected on my scope. There are some small spikes on the peaks of the sine wave, identical at top and bottom, which aren't visible if I reduce my scope to 20MHz bandwidth. I don't expect it to be an issue for any of my devices. I'm now working on converting a used Extron ADA 4 300MX video distribution amplifier to serve as a timebase distribution amplifier. It works as advertised and Mr. Sayer is very helpful. 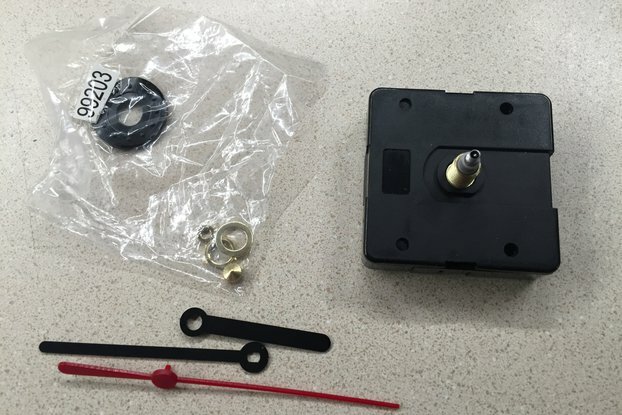 As a hobbyist I found that I needed a reliable timing source for measurements, and associated experiments. I ran across this and gave it a try. First, it was shipped to me quite quickly and arrived just a few days after I ordered it. When I opened the package, I was struck by how small the unit is! 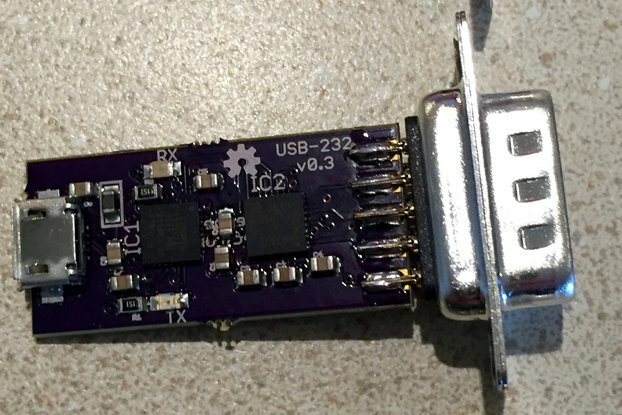 I don't know what I was expecting, since the photo from the creator didn't give a good sense of size, but I see now that if I had considered standard size of the dual BNC connectors I would have known right away that it is a very small unit. It was a pleasant surprise, and my error. I then wired the output to my oscilloscope, and after a bit of novice fiddling on my part, found that the waveform the unit was outputting exactly matched the photo on Tindie. Encouraged, I then wired it to my frequency counter and found it to be a perfect 10.000000 MHz frequency and a nice 100.00000ns period. Comparing the cost of this unit to other timing sources available, I found that the price was more than reasonable, given the tolerances stated do better than many other available or second-hand devices. I will be using this unit as the standard source for all my measurements as it is the best and most accurate source I have available. The designer of this unit, Nick Sayer, answered all of my questions quickly, happily, and patiently, as well as pointed me in the right direction to learn more. 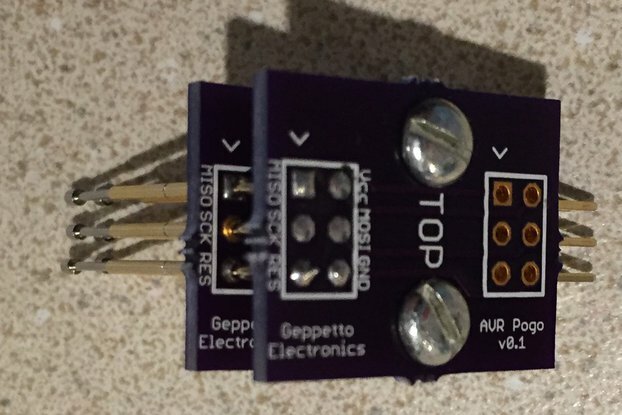 I hope that he creates more stuff to sell on Tindie, as I found this unit to be extremely impressive and can't wait to see what he comes up with next. 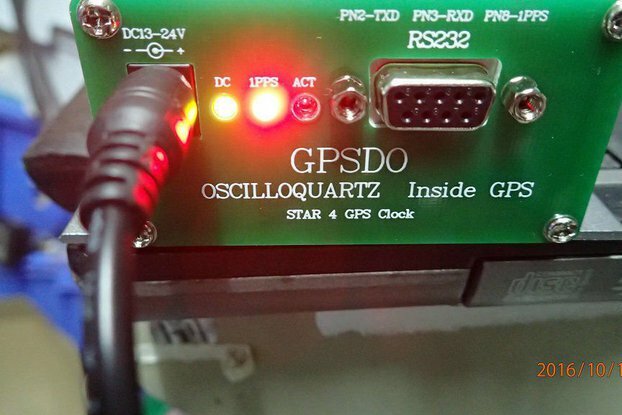 This GPS Disciplined oscillator keeps its promises and is crazily5stable and accurate! Product is very well built and looks almost professional. Very simple to us it only needs a GPS patch antenna to start getting fixed and disciplined. Shipment was very quick and affordable to France. Communication was great with the store owner.